This award was presented for the first time in both Canada and the USA last year, and the winners faced decidedly different circumstances for which they had to respect diversity. For the Saint Paul, Minnesota, Public School District (SPPS), the task was to upgrade 72 district facilities (US $2.1 billion in assets) to meet the needs of a very diverse set of students with contemporary needs and expectations. Over 100 languages and dialects are spoken at home. 72% of the students live in poverty. Some years ago, the district made a deep commitment to racial equity, and like many school systems is moving toward a student-centered, personalized approach to learning, to better prepare students for 21st century educational, employment, and community expectations. In designing a process for the new Master Facility Plan, the Facilities Department adjusted itself in parallel with the change in the educational approach, shifting from an “expert” model to an inclusive, stakeholder-centered approach. They adopted the IAP2 Core Values, and given the technical, regulatory, and funding constraints put the process at “Involve” on the IAP2 Spectrum. At the same time, they agreed whenever possible to choose techniques that leaned toward “collaborate” on the Spectrum to demonstrate their commitment to understand and incorporate multiple perspectives and new ideas. 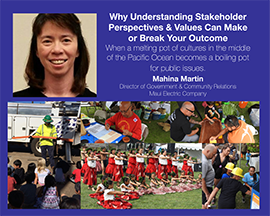 A strong stakeholder analysis process made clear that students, families, staff, and community partners were among the key stakeholders, and in accordance with the Core Values they must genuinely help shape of the process. A large and diverse group from across the district sat on the planning committee to frame the overall effort and serve as process stewards to ensure it was welcoming, inclusive, and respectful of all stakeholder groups and demographics. Per the Core Values, a key priority was ensuring that participants believed and could see that their contributions made a difference. School-created internal teams thus included the usual leadership and staff and students, parents, and community members. Further, staff and consulting architects participated in a two-day racial equity training course. Those school teams and the planning committee then helped design a series of Saturday morning workshops that brought together teams from multiple schools within a K-12 pathway. Using inclusive, fun, and highly interactive techniques, participants worked together to build empathy across school communities; frame cohesive supports for students throughout their K-12 journey; and understand the different ways each site could meet needs and requirements. By intentionally supporting participation with dates and times chosen by stakeholders, transportation, food, childcare, and interpreters, 818 stakeholders participated in 2,753 workshop hours, across 14 school pathways, and helped shape 68 building plans. As a result of this intentionally inclusive and groundbreaking engagement work, SPPS has formalized its commitment to long-term and ongoing stakeholder engagement in facility planning – and the SPPS Board/Trustees recently approved $500 million in facility improvements over the next five years. Watch the SPPS video here. | Check the Webinar Archive here. The ‘Namgis First Nation and the Village of Alert Bay share tiny Cormorant Island – off the northeast coast of Vancouver Island. The two communities have a unique mix of separate and combined cultures, histories and economies. The island was, in fact, the economic hub of northern Vancouver Island, due in large part to the commercial fishery. But in the 80s, the fishery declined, and when the world economy sank in the early part of this century, businesses closed and young people started moving away. The two communities decided the only way to address the new reality was to increase levels of cooperation in search of a solution. EcoPlan International was called in to help produce the new Economic Development plan. The process involved deep P2 from the beginning to build trust and discover common values. As practitioners, EPI’s Colleen Hamilton and William Trousdale realized they had to learn the engagement context of two very different communities sharing the same, small space. They did so by walking the streets and talking to people – “intercept interviews” – and getting beyond the “usual suspects” in a P2 process. As well as “meeting them where they’re at” – both physically and culturally – they enlisted local leaders to help identify people and groups that might be overlooked. They used business drop-ins and door-to-door, unstructured interviews with people and hired youth ambassadors to explain the plans to their peers. So that people could own the process, they held a “name the plan” contest, and “Tides of Change” remains synonymous with the plan that belongs to the community. A crucial step came when a major credit union opened a branch in Alert Bay. When the last bank closed a branch several years ago, local businesses were unable to continue operating and the economic decline rapidly increased. When Vancouver City Savings (Vancity) opened its new branch, it meant that local businesses could get support and money earned on the island tended to stay on the island. For the two communities, “Tides of Change” has meant another important step: economic reconciliation. This is an opportunity to bring equality through actions rather than simply words. Watch the Tides of Change video here. 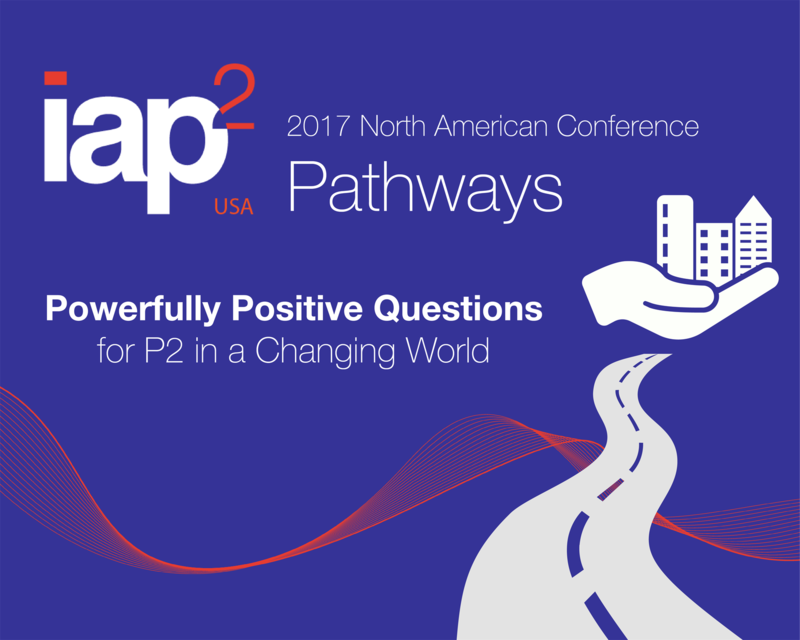 IAP2 USA members can watch the recording of the webinar, and get access to some of the resources mentioned here. Note that Cristelle, Abby and Zane are inviting comments, questions and experiences you might have had with toolkits, yourself. This question was on my mind as I attended the International Association of Public Participation (IAP2) 2016 North American Conference which took place in Montreal this past September. IAP2 members are community engagement professionals working in a range of fields and dedicated to promoting a holistic approach to engagement. They are perhaps best known for publishing the “IAP2 Spectrum of Public Participation” which provides a practical framework for analyzing various kinds of engagement strategies and tactics as they move from just informing the public to actually empowering residents in decision-making for the future of their communities. The theme of the conference was “Who Cares About Public Participation?” and it was inspiring to spend two days with folks working across many fields who are passionate about this topic and work hard to increase the impact of meaningful public participation. This question of “who cares?” also made me think of the tireless neighborhood advocates and organizers in the community development field in Detroit and across Michigan. Whole-hearted and intentional community engagement and decision-making that drives development speaks to the very core of why I am proud to be in this work. For many of us, it is the mission of community development to move the needle for the equitable rebuilding of our neighborhoods that includes everyone, in particular the most disadvantaged, and historically dispossessed members of the community. As our cities and communities continue to evolve and change, we know that meaningful and equitable community engagement is critical in pursuing this goal. The community organizing saying: “Nothing about us, without us, is for us” is particularly relevant for community development work in a time of rising economic, social, and racial inequality in cities. By now you may be thinking that these are all great ideals and slogans, but how do we exactly raise the bar for engagement so that we can have better, more inclusive results in our communities? CDAD’s work in recent years in community planning and engagement has helped us learn a lot about what works and doesn’t, and we have been inspired by innovative practices across the country that center residents in decision-making such as Community Benefits Agreements (currently a hot topic in Detroit), Participatory Budgeting, and expanding access to local Boards and Commissions. There is also a growing body of research and advocacy that is helping to raise the profile and expectations for meaningful community engagement for both non-profits and local governments. 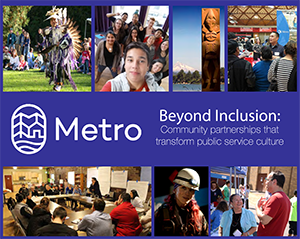 In addition to IAP2, some of our favorite resources include: Building the Field of Community Engagement, Policy Link Guide to Community Engagement, Authentic Community Engagement – Voices for Racial Justice, and plans for equitable community engagement published by municipal agencies in Seattle and Minneapolis. 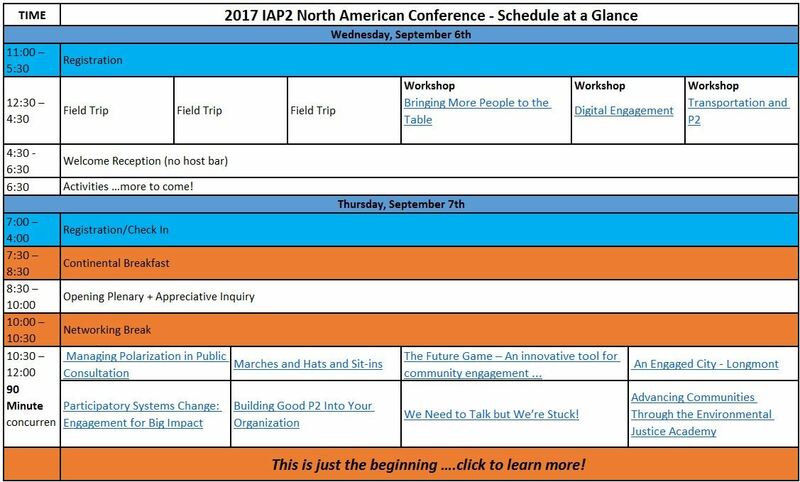 For me, attending the IAP2 North American Conference was an energizing experience where I was able to dig in to the best ideas and practices around community engagement, learning and sharing with peers and experts across the field who are working to raise the bar for better, more equitable community engagement. I am excited to bring what I learned in Montreal back my work at CDAD as we continue promote strategies for building trust and relationships that empower the public to meaningfully participate in and impact the changes and development taking place in Detroit. Community Development Advocates of Detroit (CDAD) is Detroit’s association of Community Development and Neighborhood Improvement Organizations and we are a catalyst for the transformation of our neighborhoods, led and inspired by residents, community-based organizations, and other community stakeholders. CDAD works to enhance the capacity and effectiveness of Detroit’s community-based organizations, initiatives, and residents through advocacy, training, technical assistance, networking opportunities, information sharing, and facilitating common action.